Three of the new F-150's engines are six-cylinders; if you're still a V-8-only kind of truck driver, be prepared for a Lariat model priced at least in the low $40,000s. The 2015 Ford F-150 delivers on the promise of better utility through light weight; fuel economy is still left undecided. It isn't anymore. 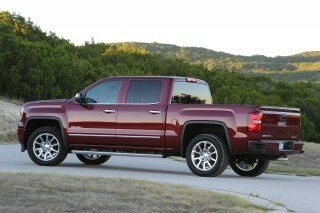 Trucks are being reined in by new requirements that will force dramatic change. With the new F-150, Ford is taking the plunge before its top rivals, with a lighter-weight aluminum body that rescales every metric possible. The F-150 is the most consequential new vehicle in the past 25 years—Volt included—and it's been named the 2015 North American Truck of the Year. The pickup's body and bed are composed from glued and riveted aluminum panels, akin to the technique Ford pioneered with Land Rover and Jaguar before it sold them. The ladder frame? Almost all high-strength steel, with a buffer between for long-term durability. It's an expensive gamble, one that Ford claims results in overall weight loss of more than 500 pounds, from last year's roughly comparable models. The slimming enables one great new downsized engine, increases the capability of the remaining powerplants, and is said to boost fuel economy by 5 to 20 percent--though Ford has not yet released final EPA figures for any single F-150 variant. You'd never know the F-150 is such a radical by its looks. The F-150 goes out of its way to play down its radically new body structure, wearing every possible right angle, even ditching the few rounded shapes it once wore. Make no mistake, every square inch is detailed to cheat the wind, to make it easier to extract every possible tenth of a mile per gallon from a classically styled pickup truck. Outside and in, though, the F-150 barely makes mention of the fact that's it's without a precursor in the truck world. Two of the F-150's powerplants are carried over, with some updates, while two are new. 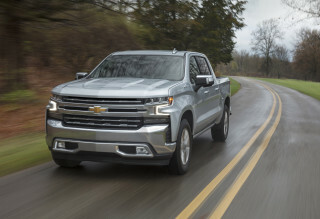 The base engine is a 3.5-liter V-6, replacing last year's 3.7, down slightly to 283 horsepower--but with the weight loss, it can be fitted to a crew-cab body for the first time, or configured with a max tow rating of 7,600 pounds. We still think the torquey 2.7-liter turbo V-6 is a better choice, for just a $795 upcharge. It's rated at 325 hp and 375 lb-ft of torque, tows up to 8,500 pounds, and has stop/start to help what Ford says are the best fuel-economy ratings in the F-150 lineup--and of any gas-powered full-size truck. For the luxury-truck crowd that tows often, Ford carries over the 5.0-liter V-8, now at 385 horsepower, or the even more capable twin-turbo 3.5-liter V-6, at 365 hp. The former has the F-150's top payload rating at 3,300 pounds; the latter, the top tow number of 12,200 pounds, which Ford says is best in the full-size class, even after the latest SAE J2807 ratings system is applied. All four engines are paired to a six-speed automatic transmission. Both 4x4 and 4x2 drive configurations are available. Electric power steering is standard across the board, and it's light and quick, which doesn't sound very trucklike but complements the new F-150's road manners. The Ford truck has exceptional ride isolation, quietness on the road, and a composure that belies the body-on-frame design. The F-150 also holds passengers and cargo better than ever. Fleet-duty Regular Cabs aside, the SuperCab and SuperCrew four-doors have great space to match up with the usual five-and-a-half, six-and-a-half, and eight-foot beds. The beds themselves can be optioned up with some clever and useful features. There are loading ramps that lock into the bedsides, for easy ATV loading; a BoxLink system that fits cleats and brackets to the bed so that it can be divided and so cargo can be anchored; LED lighting in the cargo box; and a deployable bed step. Our favorite is the tailgate step that slides out, along with a picket-style handrail. It folds in and out of the way inside the tailgate, but can support up to 500 pounds of weight on its slim steps. The NHTSA gives the F-150 SuperCrew a five-star overall rating. It's possible the F-150 could be the first pickup truck to earn the IIHS' Top Safety Pick+ award, since it offers forward-collision warning systems to go with its stout body. A rearview camera is standard on most higher-end trim levels, and the F-150 can be fitted with surround-view cameras, an especially good idea for long, bulky vehicles when they're not in their native home-improvement habitat. The F-150 pares down its trim levels in this transition year to XL, XLT, Lariat, King Ranch, and Platinum. New equipment offerings include inflatable rear seat belts, pickup-box LED lighting, Sony premium audio, and, on Platinum models, real wood trim. An off-road-oriented FX4 package will be available, bundling off-road-tuned shocks, skid plates, and an electronic locking rear axle. Prices start at a reasonable $26,615, but if you haven't shopped a full-sizer lately, you'll need smelling salts for the $60,000-plus stickers on King Ranch and Platinum trucks. The F-150 answers most of the short-term questions about how aluminum can make a vast difference in trucks as it's doing in cars. It outpaces the past Ford trucks on almost every specification--it's quieter, it can tow more, and it promises to be more fuel-efficient. The long-term riddles--repair costs, insurance rates, real-world fuel economy--are ones we'll keep revisiting as the F-150 rolls out to showrooms late this year. Upright styling is the hallmark of the Ford F-150 pickup truck, even as it switches to an aluminum body. Ford has changed forever how new pickup trucks are engineered, but it hasn't ventured very far in how they look. The F-150 is no Avalanche, no Ridgeline, and we give thanks for that. But like the mid-2000s Jaguars that Ford helped to create, the new F-150 doesn't say much at all about its radical body structure with its styling. It's like the vast majority of hybrids that don't do much at all to look like gas-electric fuel-savers. The F-150 steers very clear of looking like anything but a tough truck. It's a Whitman's sampler of rectangles, but every surface is managed to make the aluminum panels less expensive to produce, and better at cheating the wind for a fraction of a mile per gallon. The grille is tall and proud, but the headlamps are faired back, with rectangular insets that are meant to evoke some of the earliest F-Series trucks. On some trims, they're lit by LEDs, a feature we expect to become standard issue on more trim levels in years to come. The hood is beveled to lift air up and over the flush-mounted windshield and the roof--and there's even an option for a flush sliding glass window at the back of the cab. The tailgate doubles as a spoiler, and like with the headlamps and taillamps, it's faired to keep the airflow managed as well as it can be, around such a high, bluff shape. Ford's kept the beltline low, which helps connect the driver to the road from the inside of the F-150, where the angular shapes have won out over the round. The air vents are the most notable casualty, though we like how the tall, beveled vents on the center console reinforce its mass. In other ways, it's mostly similar to the outgoing F-150's collection of shapes and controls, all scaled and sized for big-handed operators, with more hard buttons restored to the dash even on versions equipped with the MyFord Touch screen interface. Real wood trim and lovely leather make their way into King Ranch and Platinum models, but at first glance and touch, the Ram's Laramie Longhorn interior seems more subtly rich. Strong turbo engines are the mainstays of the F-150's new lineup; light weight makes it the best-handling full-size truck. The new Ford F-150 makes strong-performing turbocharged engines its mainstays, transplants electric power steering into all versions, but steers clear of air suspension and rear coil springs as the competition has adopted. Instead, it puts faith almost entirely in the F-150's new, mostly aluminum body structure, as a means to better performance--and it pays off. Don't fear the lightweight body--there's nothing lightweight about the ability of the new F-150 to tow and pull like it has in the past. The F-150's essentially had the equivalent of weight-loss surgery, dropping upwards of 500 pounds. 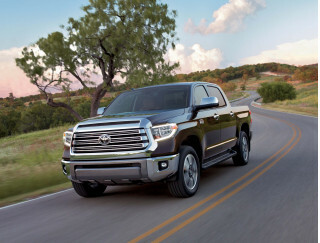 The ladder frame remains steel, mostly high-strength steel in this truck, so that the hybrid composition can still boast some class-leading numbers. 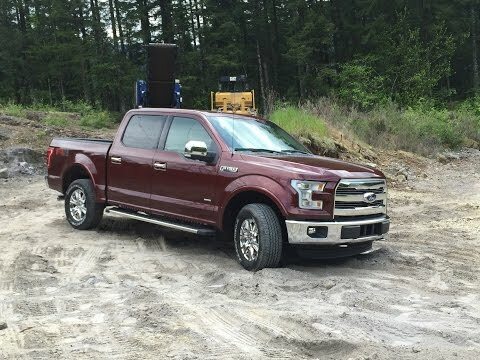 At the low end, it's down to 1,600 pounds of payload and 5,000 pounds of towing--but at its strongest, the F-150 can carry 3,300 pounds and pull 12,200 lb. 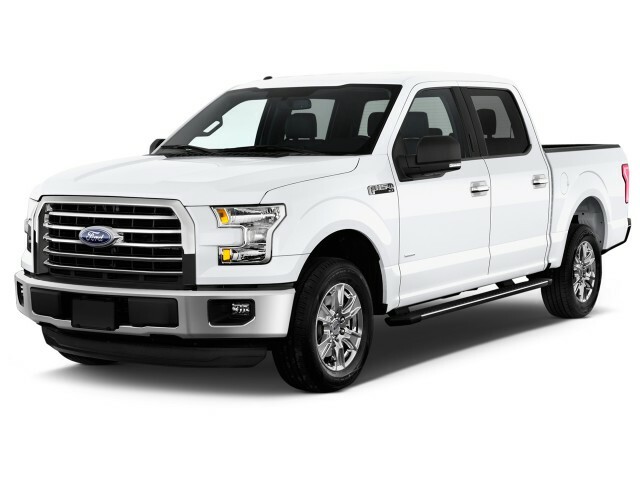 The effect of the aluminum body cascades through all the F-150's systems, enabling downsized engines, jacking up its towing and payload ratings, allowing a wider body with a lower driving position--making it more trucklike and more carlike all at once. The leaner engine lineup now counts three V-6s, two of them turbocharged, and just a single V-8. The standard 3.5-liter V-6 engine replaces the former 3.7-liter; it rates 283 horsepower and 255 pound-feet of torque, enabling a peak towing capacity of 7,610 pounds and a top payload capacity of 1,910 pounds. We were only able to drive it on an off-road course, with no chance to test towing or street performance. For now we'll leave the fleet-spec impressions to the spec sheet itself: this base F-150's lost enough weight that Ford now offers it as a four-door SuperCrew. The drivetrain that makes the base six an also-ran is Ford's new turbocharged 2.7-liter V-6, outfitted with standard stop/start. It's conceived as a replacement for a small-displacement V-8, and merits the comparison. It's a lightweight, compact engine that has seen lots of attention paid to make it a broad-spectrum choice for F-150 drivers that don't push max towing or payload limits. Rated at 325 horsepower and 375 pound-feet of torque, it's paired smartly to the six-speed automatic that's standard across the F-150 lineup. It pulled away strongly from stops in the unladen, heavy-spec F-150 Lariat SuperCrew we sampled. It takes a fair amount of foot to trigger downshifts--but its stop/start had one of the more seamless wakeup cycles we've experienced. With V-8-like towing capacity of up to 8,500 pounds, and payload capacity of up to 2,250 pounds, the $795 optional engine is the smartest bet for truck owners who use their pickups more like SUVs. Between the top two engines, it's largely a matter of personal choice and maybe pride. The 5.0-liter V-8 is pegged at 385 horsepower and 387 pound-feet of torque, up slightly from 360/380 in last year's truck; the twin-turbocharged 3.5-liter V-6 checks in at 365 hp and 420 lb-ft. The six is even more a V-8 substitute than ever: Ford pipes in V-8 engine noise to layer over its less rumbly sounds, for those who "have to have a V-8." We towed a hefty 9000-pound trailer in the V-8 version and felt it using every erg and gear to yank the trailer to highway speeds; it's possible the turbo six's extra torque would make that a little easier. If you're concerned with payload, the highest 3,300-pound rating only comes with the V-8; max tow of 12,200 pounds will require the twin-turbo six. All four engines are paired to a six-speed automatic transmission. Both 4x4 and 4x2 drive configurations are available. Electric power steering is standard across the board, and it's light and quick, which doesn't sound very trucklike but complements the new F-150's road manners. The 2015 F-150’s front suspension is a coil-on-shock independent arrangement, while the rear retains the Hotchkiss-type solid axle riding on leaf springs and outboard shock absorbers staggered to reduce axle windup. The F-150 doesn't have a rear-coil or air-spring setup like the Ram 1500, or the adaptive dampers of the GMC Sierra Denali. Even so, there's a cushion of ride isolation that stems directly from the lightweight body. At low and moderate speeds, the F-150 manages ride motions like a smothering parent. The truck personality surfaces when you push it harder across bad roads--up and until that point, the F-150 does a more convincing impression of carlike handling than any full-size truck before it, smoothing out corners and cruising through sweepers like a well-tuned full-size sedan. Crew Cabs have great interior space, and the F-150 claims best-in-class payload and tow ratings. The F-150 is spacious and solid, discounting any gut feeling that its aluminum body isn't as tough as steel at the first turn of the wheel. We might prefer the style of a Sierra or Ram, but the Ford's as substantial as any of its competition, though it's radically different under the paint. Just as it ever was, Ford sells the F-150 in three cab styles: the two-door Regular Cab, the extended SuperCab which retains its rear-hinged rear doors, and the four-door SuperCrew. We've been in the four-door models, and the F-150's two extra inches of width make themselves known right away. The front passenger space is squared off and as roomy as a lie-flat seat on a plane. Ford's put the console and door armrests at the same height, and that will keep your chiropractor and your elbows happy over long distances. Between the front passengers on most models, there's a wide, deep center console with enough capacity to hold a laptop, in addition to the spaces it reserves for cell phones, drinks, pens and business cards. The driver and passenger both get a set of controls that are simplified and scaled to operate while wearing work gloves. The infotainment functions have direct, hard-button access to most key features, while things like multicontour seats are controlled by a layer inside the MyFord Touch interface, where they're specified. There's only slim room behind the seats in any regular-cab truck; moving to the SuperCab, Ford fits a pair of seats unusable by anyone of driving age--but the seats do flip up against the bed wall, revealing a flat floor that's great for easy loading of cargo. On SuperCrew F-150s, the rear seats have very good leg room and a perfect degree of recline, though the bottom cushion is a little lower than we'd like. SuperCrew seats can fold up against the bed wall, too, and in both four-door body styles, there's under-seat storage that will secure some smaller, high-priced tools when the need arises. Depending on the body style, Ford lets truck drivers choose from three bed lengths: 67.1, 78.9, and 97.6 inches. You'll need to cruise Ford's consumer site for the endless particulars: regular cabs go with the longest beds, crew cabs with the shorter beds, but in between are dozens of exclusions by trim level and powertrain, as is the case with the tow and payload ratings--they range from a low of 1,600 pounds for payload and 5,000 pounds of towing (with a new Class IV hitch as the only option), to a high of 3,300 pounds of payload potential and 12,200 pounds of pulling power, depending on the configuration. The F-150, by the examples we drove, is a tighter, more impressively welded/glued/riveted/bolted-together truck than it was last year. It's very quiet in the versions we drove, with doors that thump closed expensively, even if the door skins themselves flutter a little. That said, we haven't been in an XL regular cab, where the glass isn't acoustically tuned, or the trim quite as nice. We have been in turbocharged models where Ford pipes in the automotive equivalent of Muzak--artificial engine noise to make sixes sound like eights. It's pleasant but jarring if you know what's really going on behind the scenes. Just like Muzak. The bigger question in quality for the F-150 is in how it holds together over the years, and how expensive it is to maintain, to insure, and to repair. Ford says the F-150's aluminum body and steel frame have been pored over endlessly to ensure the benefits of aluminum come through--in corrosion protection, in lower fuel costs, in structural strength. Ford also says it's prepped some 3,000 body shops nationwide on repairing the new truck. Will owners be as happy with lightweight construction after a major accident, or in a dozen years? Those questions won't have answers until hundreds of thousands of F-150s have been on the road, for a long time. Ford is already proving the worth of the F-150's aluminum body construction with five-star safety; and some of its active-safety items are segment firsts. With its completely new body structure, the Ford F-150 has incomplete crash-test ratings to back up its aerospace-styled construction and its laundry list of advanced safety technology. Both of those things could make it the first pickup to earn the Top Safety Pick+ award from the Insurance Institute for Highway Safety (IIHS)--but as of yet, the IIHS hasn't reported scores. The National Highway Traffic Safety Administration (NHTSA) has--and it gives the F-150 five stars overall, with five-star scores in all subcategories, for SuperCrew models. For reference, the prior F-150 earned four stars from the NHTSA, and a Top Safety Pick award from the IIHS. Safety technology is one frontier where the F-150 will have a considerable lead on its competition. The usual airbags and stability control are complemented by things like a second-row inflatable seat belt; additional braking help via Curve Control; adaptive cruise control; blind-spot monitors; and a lane-keeping system, which nudges the truck back into its lane when it detects a crossing of the double yellow. Some of the best additions are the simpler ones, though. A locking tailgate and tonneau cover turn the bed into a secure storage area. An optional set of cameras stitches together a 360-degree view around the F-150, for tucking it into a garage or a tight parking spot with an expert touch--and helps overcome the blocky F-150's visibility issues. Underneath it all, the lighter and more controllable F-150 is its own safety device: it's easier to handle and to drive than ever, thanks to major weight loss. Fewer trim lines mean more packages of features; there's more technology than ever inside the F-150's cabin. With so many possible combinations available within the Ford F-150 lineup, we're going to shorthand it for you thusly: work truck, play truck, tow truck, muscle truck. That makes it easier to cut through the five trim levels, three body styles, three bed lengths, and four engines offered in the new F-150--though actually, that's down considerably from the past generation, when Ford offered up to 11 different badges. 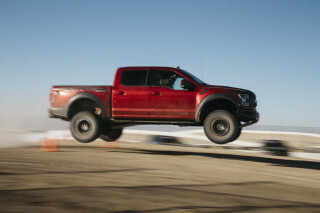 They've dropped the STX, FX2, and Limited since then; the SVT Raptor is on pause; and the FX4 is now available as an off-road package on every trim. The F-150 XL starts the configuration process with a base price of $26,615. It can be ordered in any bed length, any cab style, and with any drivetrain, depending on the configuration beyond the standard V-6--some combinations aren't permitted, though for the first time, the base V-6 can be paired with a SuperCrew body. All F-150s have a standard automatic transmission and rear-wheel drive. In addition, the XL comes with 17-inch tires; manual windows; an AM/FM stereo; a vinyl floor; manual locks; air conditioning; rear flip-up seats on four-door models; and tilt/telescoping steering. 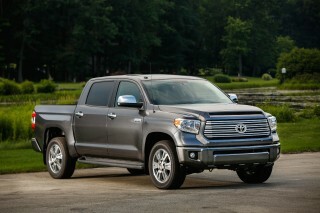 Major XL options in packages include power windows; a power tailgate lock; power mirrors; automatic headlights; a CD player; SYNC; cruise control; BoxLink (see below); and appearance packages, as well as towing packages and 18-inch wheels, as well as a new Class IV trailer hitch for towing less than 5,000 pounds. The FX4 off-road package can be added to four-wheel-drive models, improving trail capability with an electronic locking rear axle, skid plates and off-road-tuned shocks. Stand-alone options include satellite radio; a tailgate step (see below); trailer-tow mirrors; a power rear window; a rearview camera; rear parking sensors; cloth seats; a 110-volt outlet; a bed divider; a bed liner; a tonneau cover; and telematics service for on-board vehicle tracking. The F-150 XLT offers the same drivetrain, cab and bed options for a base price of $31,890, adding a standard CD player (Ford says its truck customers still want it); cruise control; power locks; power windows; cloth front seats; and SYNC. Major option packages bundle power mirrors; power-adjustable pedals; satellite radio; remote start; power driver and front passenger seats; heated front seats; rear parking sensors; a power-sliding rear window; towing and off-road packages; and 18- or 20-inch wheels. Blind-spot monitors, inflatable rear seatbelts and a moonroof are stand-alone options, as are navigation; a bedliner; a tonneau cover; and a bed extender. From this point, the F-150 becomes a lavishly equipped plaything, priced for a luxury crowd. An XLT with the 2.7-liter turbo V-6 we've driven wore a pricetag of more than $49,000, a witness to the major price run-up in full-size trucks over the past decade. The $39,880 F-150 Lariat cuts down the herd to simpler build combinations. There's no Regular Cab version, and engines are limited to turbo 2.7-liter six or V-8 only. Standard features include a rearview camera; ambient lighting; pushbutton start; power-adjustable pedals; leather-trimmed/heated front seats; satellite radio; and SYNC. Options including blind-spot monitors; rear parking sensors; second-row heated seats; a power tilt/telescoping wheel; HD radio with Sony audio; LED side-mirror spotlights; two-tone paint; adaptive cruise control; and parking assist. The $49,690 King Ranch comes as a Crew Cab only, with either of the shorter pickup beds, with the V-8 standard, and the 3.5-liter turbo V-6 as an option. Standard features include leather seats and trim; heated and cooled power front seats; inflatable rear seatbelts; Sony sound with HD radio; navigation; remote tailgate release; rear parking sensors; LED spotlights; and a console that flows through to the rear seats. 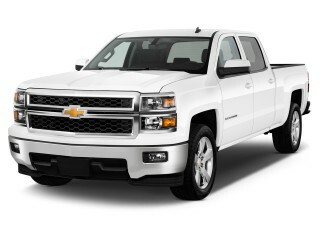 Options include paint and trim choices; surround cameras and lane-keeping assist; power running boards; blind-spot monitors; tailgate step; a bed extender; box side steps; adaptive cruise; park assist; a moonroof; 20-inch wheels; and a max trailer-tow package. The configuration choices are the same on the $52,155 F-150 Platinum, which gets standard LED headlights; blind-spot monitors; its own trim; power running boards; remote start and tailgate release; rear parking sensors; 20-inch wheels; aluminum trim; ambient lighting; inflatable rear seatbelts; multicontour heated and cooled power front seats; wood trim; and navigation with five years of real-time traffic and other data. Options are similar to those on the King Ranch. Among the F-150's best new features...well, there are many. They include loading ramps that lock into the bedsides, for easy ATV loading; a BoxLink system that fits cleats and brackets to the bed so that it can be divided and so cargo can be anchored; a rearview camera with trailer-hitch assist that projects a line to the screen, so amateurs can hook up a trailer in fewer than a thousand tries; LED headlamps and lighting in the cargo box; a deployable bed step; and best of all, a step that slides out of the tailgate along with a post that serves as a handrail, for walking in bed loads. It's rated to hold up to 500 pounds, what looks like an impossible amount given the way it folds and stows away in the tailgate. 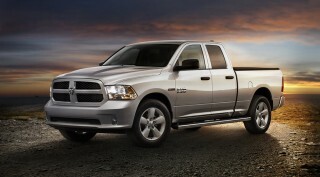 The F-150's gas mileage is improved, but some Rams still earn better EPA figures. Ford says the F-150 betters its gas mileage through a few channels: weight loss, downsized engines, active aero hardware, and in the future, more gears. Since we first drove the 2015 Ford F-150 this summer, its fuel economy had been an open question. Now that question has been answered: Ford has posted the aluminum truck's EPA gas mileage ratings, and they're a big improvement over the last truck--but not as much a competition-killer in base versions. The most efficient F-150 is the one powered by the 2.7-liter turbo six, at 19 miles per gallon city, 26 highway, and 22 combined. 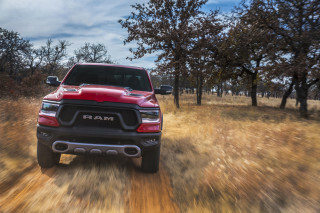 It's 3 to 4 mpg higher than Ford's comparable V-8 F-150 from last year, but it's behind the Ram 1500 EcoDiesel, which gets a 29-mpg highway rating. The F-150's 3.5-liter turbo six is rated at 17/24/20 mpg. The base V-6 is the least improved: Ford quotes 18/25/20 mpg for the F-150, while the Ram V-6 posts identical numbers and GM's trucks are just a mile per gallon behind on the EPA highway cycle. No doubt the F-150's aluminum body goes a long way to promoting higher gas mileage--but it's not easy to directly compare the new F-150 to outgoing mid-level models, in terms of overall weight. Ford claims weight loss of up to 700 pounds; we think 500 pounds is a sustainable figure, and still admirable, when base V-6 is compared to base V-6. Moving up the ladder, it's harder to compare the new 2.7-liter EcoBoost to a theoretical smaller-displacement V-8, or swap in freely the 5.0-liter V-8 as the substitute for the former 6.2-liter V-8, when there's more standard equipment adding to the weight totals. The 2.7-liter turbo V-6 does benefit from standard stop/start technology. As in other setups, it cuts off the engine at longer pauses and stops to save gas, and restarts when the brake is released. It's disabled in tow mode or when the truck is put into four-wheel drive. Turbocharged F-150s also have active grille shutters to smooth airflow over the front end, and Ford says it's spent a lot of time on aero details on the new truck to deliver fuel economy gains in the shape of the body, not just in the composition. Ford is working on a ten-speed automatic transmission with rival GM, and the gearbox should slot into the F-150 one day--but it's not expected for a couple more model years yet. This vehicle is a technological tour de force. I traded my '09 F150 for the 2015. This time I got the Lariat loaded up with everything but 4wd, dynamic cruise and self parking. It is amazing to drive. They updated the steering to a more car-like feel. The... I traded my '09 F150 for the 2015. This time I got the Lariat loaded up with everything but 4wd, dynamic cruise and self parking. It is amazing to drive. They updated the steering to a more car-like feel. The obvious changes of style and aluminum are a boon and the many configurable options make it very customizable. I needed a vehicle to tow a heavy travel trailer so the 3.5 eco was the best choice for that and the need of daily driver. Mine will tow 11,900 pounds and is up to the task. The ride is very quiet and controlled. The engine is very powerful and aside from the added sway from height, is like a sports sedan. The seats are comfortable and the feature set is great. This truck has the new 2.7 engine. There is plenty of power and under normal driving you can't tell you have the smaller engine. I have not towed anything yet so it is hard to tell about the towing. Gas... This truck has the new 2.7 engine. There is plenty of power and under normal driving you can't tell you have the smaller engine. I have not towed anything yet so it is hard to tell about the towing. Gas mileage is still out so I can't comment much on that. The power is rather amazing from the small engine. It is possible to break the tires loose, what the law would call laying drag. That is from a low speed rolling start. The brakes tend to grad and overly sensitive. The interior is nicely layed out with a attractive dash. The normal bells and whistles plus a few more on the Lariat. If the industry keeps up a driver will have to much information. The leather seats are heated and cooled and conformable. You can see good while driving and the safety features helps a lot. The crew cab has plenty of interior room but bed size is smallish. I would recommend the build in steps. Lighting is pretty good in the bed but the tie downs aren't very impressive. I like the 302 engine for fuel and power but comfort is lacking on my 2012 ford f150. Looking for a different year of the Ford F-150?